I was looking for a large heart to hang outside for Valentine's Day and found this last year. It was exactly what I was looking for and every one of my neighbors that pass by comment on it. I wish I could post a photo of it to share. Back hole in back is in perfect place to hang by magnet on a steel post. Union Products is back in business! Only General Foam and Union Products a division of Cado still make blow molds. Now that Union Products is back in business we are starting to see molds that haven't been made in years. The heart is awesome! Can use a drill and make a one inch hole and add a light kit from Dollar Tree for a $1. I purchased two red hearts and they light up awesome! I bought 2 of these many years apart. They came with lights. It's a perfect window display! Hung this outside on my house. It's awesome. I love it. I purchased 3 hearts several years ago. I recently ordered 2 more. The new hearts do not have lights. I saw the other review it was very simple to drill a 1" hole and add a light. I love them.The ones I purchased several years ago are still just like new. 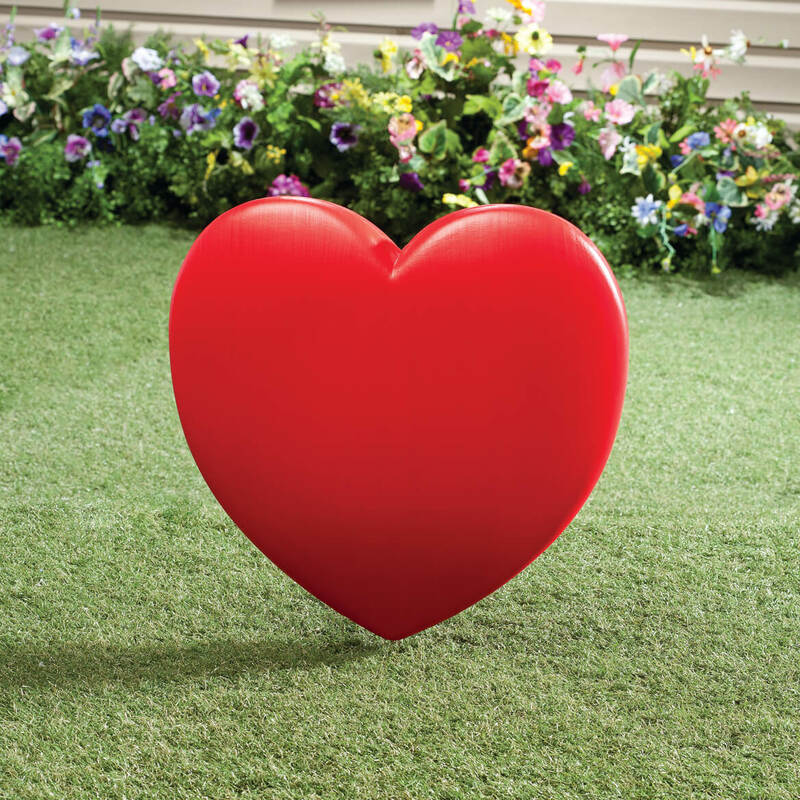 This giant plastic outdoor heart is very nice & looks beautiful in my yard. I have gotten many compliments from visitors, family & friends. A good price for the item. My only disappointment is that it doesn't come with a yard stake & I had to purchase a yard stake from another company. I cut a hole in the back and added my own light (from old xmas decoration). Use it as an outside yard decoration for February! Has not been damaged at all by the snow, sub-zero temps, or high winds. Just wish it had a built in hanger too. Every stake we bought did not fit. It would flop to the right or left. While on the stake the wind blew it around. Good for hanging. I have hung this on my front porch for Valentine's Day. I'm not sure how long it will stay hanging. The place where you hang it from is very iffy. Had purchased many years ago, the heart came with light and a stake. Now no light or stake. Had cut a hole where used be one and purchase a light.The price seemed to be higher with less. I Would Not Buy This Item Again "Blow Molds Should Light up"
It would have been great if it had the light fixture and hole in the back like you used to sell it. I returned the 2 that I purchased for a refund. I also paid the shipping charges back which I didn't think was fair. "You changed the product". WHY??? Doesn't make any sense to me. Very Disappointed!! I bought this for a friend who was born on Deb 14th but it's too cheap and blah to give as a gift. Very disappointed. Plus, the item has a place for a stick to display it, however, you do to get the stick. It also has a cutout in the back for hanging which again is nice but it does not include a suction cup or anything else to help you display it. Seems like it should've come with these two pieces, esp for the price. I think I overpaid by at least double and, it was a waste of money. For some reason I thought it was lighted, it is not and there is no way to make it so. It has the small hole for one stake but could not find one to use and I don't think one stake will hold it upright. Not worth the money for me. I love the size of it and it's beautiful to display it anywhere around the house. I’m an open heart nurse. I thought it would be cool to have! I wanted a large heart to decorate, I wish it was larger, at least 48" x 48"
and lighted. I find it hard to believe no one makes anything like that. I decorate all holidays, I would like a large shamrock also. I am so glad these are available again and at a reasonable price. I purchased 3 hearts several years ago. I still have them and ordered more recently. The new ones do not come with a light. I saw the other review and drilled a 1" hole and added a light. I love them. Thank you! Looks like the old blow-molds I remember as a child. It's gonna look great outside! Unique item; can't wait to see it in person. 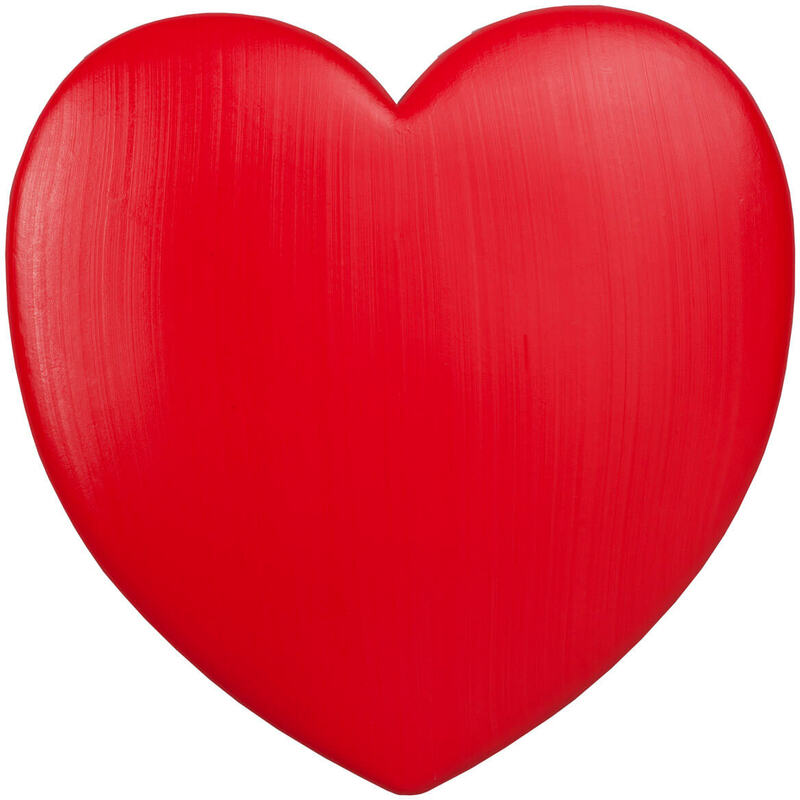 I needed a big red heart for a photoshoot and this is the only one I could find. Making electric wall sconces for Valentine's Day with these! I saw this it will be something different to put out side. I appreciate the affordability of this item! Cant wait to hang it on the outside of my house for my favorite holiday! From February to Sept-everyone loves it! Mom likes hearts since she had heart surgery. Would look great on my home for valentines day!!! I had one before and it was stolen; so I wanted a new one. I like the size. I had it years ago but it was stolen from my front yard. Decoration for my front yard! because I am moving and my neighbor asked for mine ! Hopefully to bring a smile to someone's face or to brighten their day. Unique to other outside decoration I have seen. Price is very reasonable. what the depth how deep it say 19 high 19 wide in between like a foot? BEST ANSWER: Thank you for your question. 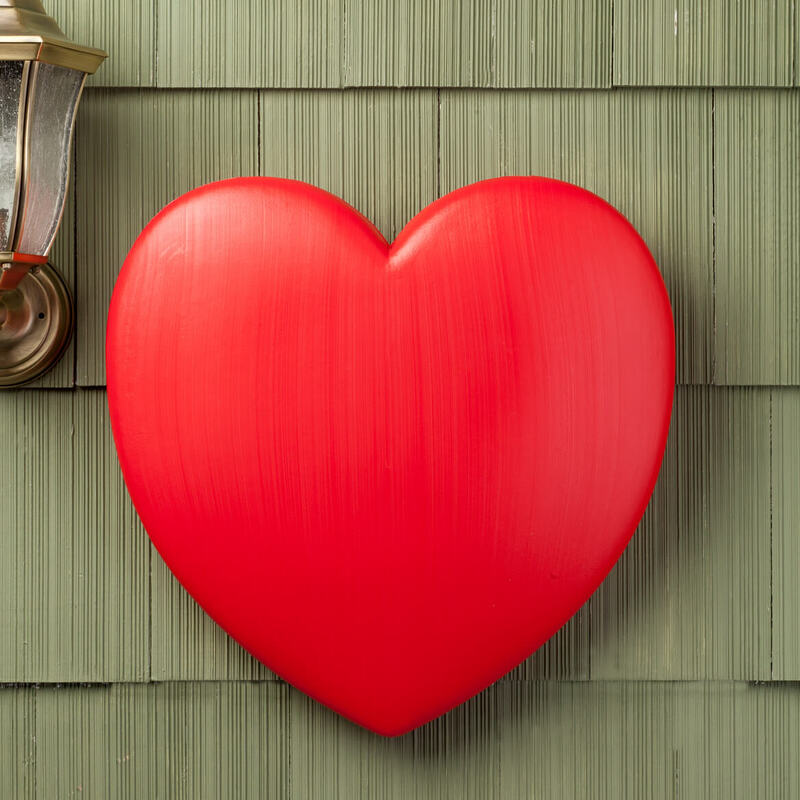 This heart is 4 inches thick.We hope this information will be of help to you. Does the heart have a hole for both stake and light? BEST ANSWER: I packed mine away when i got them to use this year. i don"t believe it did ....but real easy to do. if you have a drill and a hole saw set you can make holes any size you want and in any position... Small hole in bottom for rebar..hole in back for a village house light. you can also drill holes for tie downs or you can attach hardware..it is real sturdy plastic. hope this helps. There is a small hole on the upper back that you can use for hanging . I don't think you can put a stake in it. There is another hole at the bottom of the heart by the tip about the size of a dime. You could probably put the heart over the stake. The hole in the back is not big enough for a light. There is a section on the back that you may be able to cut out to insert a light. It has small holes, one on the back and one on the bottom. We inserted a small dowel through the bottom, secured the dowel in the other hole, and stuck it the ground--looks beautiful!~ I think the plastic is too thick to electrify the heart. This item does not light up. Hole in the bottom of item in which I will sit on a pole to hold it in place. I drilled a small hole in the back so that I can add a light. I love the item even though it didn't light up because that's a quick fix. yes..... But u can take a white marks a lot and write on it.. I wrote WITH LOVE, I ALSO STUCK A SMALL STRAND OF LIGHTS IN THE HOLE THATS ALREADY THERE AND HUNG ON MY HOUSE. BUY THE WAY IT DIDN;T FADE AT ALL LAST YEAR WHEN I HUNG IT OUTSIDE. Thank you for your question. There is a hole in the bottom for a stake to be placed in. The heart does not light up. We hope this information will be of help to you. Hole in bottom of heart for stake but NO hole for light to go into AND no cord or light to put into heart. Neither did the one I bought last year. There hole in bottom of heart for a stake. No hole for light just a place that marks where use to be one. We have had cut our own hole in. What does the back look like? People say it has a hole in the back. How big is the hole? BEST ANSWER: Thank you for your question. There two holes on this item. One is on the center in the back and it measures 5/16 wide x 5/8 H. The other hole is on the very bottom of the heart and measures ½” diameter. We hope this information will be of help to you. BEST ANSWER: Thank you for your question. No the heart is not lighted. We hope this information will be of help to you. Hi, who makes this Valentine heart? BEST ANSWER: Thank you for your e-mail. Since we have a contractual agreement with our present and former vendors or manufacturers to keep their identities anonymous, we are not able to forward their information to you. They are not prepared to accept calls and emails from the general public. We apologize for any inconvenience. Where can i buy the stakes? BEST ANSWER: Thank you for your question. You should check at a hardware store. We hope this information will be of help to you. Hi; would like to know weight of heart. Thinking of hanging from ceiling; are there drilled holes to use for hanging? BEST ANSWER: Thank you for your question. This heart weighs 2.15 lbs.We hope this information will be of help to you.